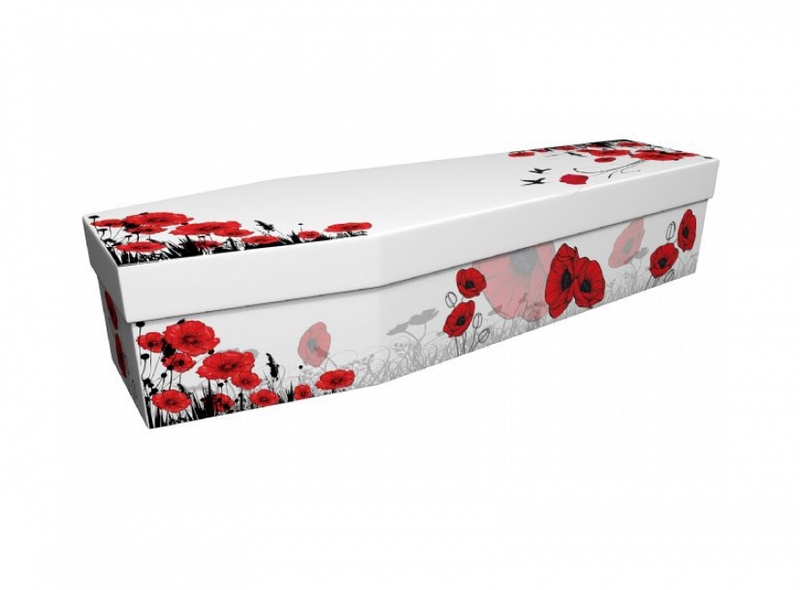 The vibrant, postbox-red flowers on this poppy cardboard coffin provide a dramatic contrast to the pristine white coffin on which they appear. The design features clusters of these iconic flowers in full bloom against silhouetted grass and foliage on opposing corners of the base and lid. Rather than photographic images, these give the impression of having been hand-drawn or painted on the surface with careful and loving attention to detail. In addition to the poppy’s role as the international emblem for remembrance, this flower has also held significance throughout the ages as a symbol of eternal and restful sleep, something we all wish for our loved ones when they pass away. The paired poppies which are represented along the sides of the coffin could be taken to show the unity, close love and affection between couples. Each poppy cardboard coffin is cleverly constructed from multi-layered, corrugated cardboard, strengthening it to take weights of up to 25 stone (163kg). It is suitable for burials and cremations alike; and moreover, the materials used are biodegradable and will burn with fewer carbon emissions than a wooden alternative. There is ample room on the coffin lid to add a nameplate or other decoration such as a photograph of the deceased, to help mourners to remember them in happier times. Our talented design team are also more than happy to work with you to design images to decorate a completely unique cardboard coffin if you so wish – simply contact us and we will discuss options.